Mary Weatherford makes large paintings comprising grounds of spontaneously sponged paint on heavy linen canvases, often surmounted by one or more carefully shaped and placed colored neon tubes. The canvas—prepared with white gesso mixed with marble dust and worked on with Flashe paint, a highly pigmented but readily diluted emulsion—supports startlingly diverse applications of color. The surface of the paint ranges from matte and velvety to transparent and translucent. The canvas is at times densely filled, reading as a painterly continuum; at others, it shifts in color from edge to edge; and at yet others it contains clusters of marks set in relatively bare surroundings. Weatherford received a BA in 1984 from Princeton University, where she took classes in studio art, art history, architecture, and engineering, and an MFA from Bard College, Annandale-on-Hudson, New York, in 2006. In her paintings of the 1990s and early 2000s, she incorporated assemblage elements such as seashells, sponges, and starfish within thin washes of Flashe color. These works gave way to the Vine paintings (2007–08), inspired by an intertwined network of ivy, followed by the Cave paintings (2010), a series based on Weatherford’s sustained observation, four years earlier, of a sea cave at Pismo Beach, where she produced small pencil drawings and paintings as the sunlight cast different shadows throughout the day. In 2012 Weatherford was a visiting artist at California State University at Bakersfield. As she drove around the small city, she was intrigued by the colored neon signs of old factories and restaurants, some illuminated, some burned out. The Bakersfield Project (2012) grew out of these drives, and it was the first series in which Weatherford incorporated neon rods in her paintings. The rods are screwed directly into the canvas and are connected by thin wires, which create a three-dimensional drawing on top of the painted background and lead down to large magnetic transformers on the floor. Casting an industrial light onto the fields of color, the neon tubes read as hand-drawn lines across the surface, at times with a blinding brightness that creates lingering afterimages. Weatherford’s use of color and light is based on her direct experience of specific locations, as well as her memories of such experiences. Manhattan (2013) and Los Angeles (2014), two major series following the Bakersfield works, additionally possess references to architectural and infrastructural details. Brooklyn Bridge (2013), from the Manhattan series, includes two neon rods—in warm yellow and turquoise—held together at their bases by a looped cord that recalls the suspension cables of the famous bridge. 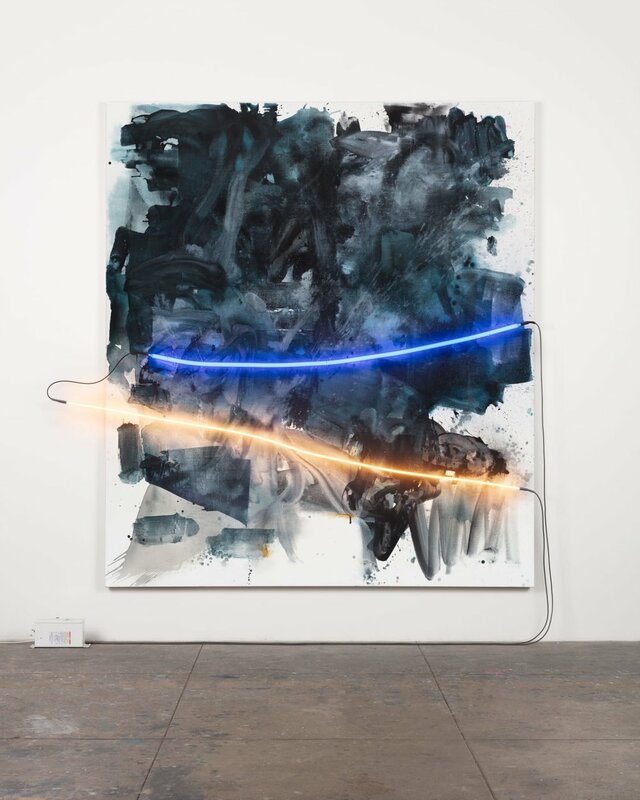 From the mountain to the sea (2014), from the Los Angeles series, attests to Weatherford’s interest not only in the city itself, but also in where the city meets nature, incorporating steely blues and grays with white and yellow lights that oscillate between the organic and the artificial. In her paintings from 2017–18, Weatherford focuses on her responses to current events, linking them to her experience of premodern narrative pictorial compositions. She thinks of these new works as aspiring to the function of earlier history paintings, which tell of actual or mythological happenings to invoke fundamental and topical concerns. Weatherford’s works expand the expressive potential of neon. Though appropriated by earlier artists for its consumerist and linguistic connotations, in Weatherford’s work the industrial material is transformed into a radically new form of abstract, pictorial drawing. Weatherford’s first survey exhibition will be presented at the Contemporary Arts Museum Houston in 2019 and will travel to the Tang Museum at Skidmore College, Saratoga Springs, New York, in 2020.